It's Chinese New Year's eve tonight and at midnight we will usher in the Year of the Dragon. Besides the usual feasts, lucky couplets and signs I have put together a traditional candy box. Each little tray in the box contains candy and sweetmeats -- symbolic of luck, prosperity, good health and progeny. My box doesn't represent all the various sweets, candied fruit, nuts and seeds we have available, but it does contain some of my favorites. First, the box itself. One box is orange colored lacquer ware and has the Chinese character "FU" on it. It means "good fortune" and "happiness." The candy box is always round to signify togetherness - no sharp corners or edges. When open, it reveals seven little shallow porcelain trays. The filled candy box is brought out when guests arrive and is enjoyed with freshly brewed tea. The pictures show two of my lacquer candy boxes. The dark one with the phoenix design is my favorite -- delicate and understated. It belonged to my mother. You can see that the box appears rather deep, but in actuality the trays are flat and it's mostly empty space underneath. Candy Box with Chinese character "FU"
What's in my candy box? Starting a the far left at 7:00 are candied kumquats symbolizing wealth and prosperity; wrapped in colorful cellophane are walnut and date candies symbolizing a sweet year; the candied lotus roots for purity and if I had room, I would have put out candied lotus seeds which symbolize many children, i.e. fertility; then there's candied coconut ribbons, the coconut symbolizes togetherness; there's the candied melon representing growth and good health; then hard coconut candy and finally, in the center, peanuts that I oven roasted with 5-spice powder, they represent longevity. I don't have the requisite watermelon or squash seeds, both symbolizing fertility -- just not enough room. I wish I could share my lucky candy box with you, but alas it can be done only virtually.... At least I can share my Five-Spice Roasted Peanuts recipe with you. They are really easy to make and are delicious -- anytime. If you are on a sodium restricted diet, you may omit the salt or reduce it to taste. Dissolve salt and five spice powder in 1/4 cup hot water. Put peanuts in an ungreased rimmed baking sheet. Pour the salt mixture over the peanuts and mix until the nuts are evenly coated. Spread out in a single layer and let sit for 15 minutes. Preheat oven to 325 F.
Roast the nuts for 30 to 35 minutes until they are lightly golden brown. Stir occasionally for even roasting. When done, remove nuts from the oven and let them cool completely before serving or storing. When cool, the peanuts will be crisp. Copyright 2012 by Helen Chen. All rights reserved. So, for all of you, Xin Nian Kwai Le (Happy New Year) and Wan Shi Ru Yi (May all your wishes come true). Wonderful lens into Chinese culture. Thanks for sharing these beautiful customs. Share your comments, questions and Asian cuisine experiences here. Like so many of us, Helen Chen learned to cook at her mother's side. But few of us had a mother like Joyce Chen. Helen grew up in Cambridge, Massachusetts, where her mother prepared the authentic dishes of her native Shanghai and Beijing with the sort of regularity the rest of us came to expect of macaroni and cheese or meatloaf. "I remember when I was little, watching my mother prepare meals for family and friends. I once wrote a list of my favorite Chinese dishes," Helen recalls, "I came up with 150 recipes. I do not have one or two favorites. All the dishes on the list are traditional and all are ones that I learned from my mother. That is what I love most about Chinese food: its variety. Taste, texture and color all come into play, as does personality and culture. I think this is what cooking is all about." Soft spoken and intensely intelligent, Helen Chen was born in Shanghai and moved to the U.S. with her family while still a baby. Helen grew up, as she describes it, in a traditional Chinese-American household. "When I was young I wanted to be totally American," she remembers. "It wasn't until I was in high school that I realized how lucky I was to have two cultures." 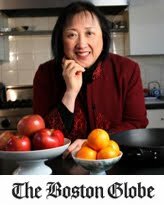 Today, Helen Chen is a widely acknowledged expert in Chinese cooking. Besides her role as an educator and cookbook author, she also is a corporate spokesperson and business consultant to the house wares industry. In 2007 she created and developed a new line of Asian kitchenware under the brand name Helen’s Asian Kitchen®, expressly for Harold Import Company in New Jersey. Having been born in China and raised and educated in the United States, Helen brings the best of both worlds to her approach to the art of Chinese cuisine. She understands the needs of the American cook as only a native can, yet she is intimately knowledgeable in the culinary practices and philosophy of China. In her active role as a teacher and educator, Helen teaches Chinese cuisine at Boston University; and, through the Anderson Foundation’s enrichment program ‘Cooking Up Culture’ she teaches Boston area school children from grades 1-12 about Chinese cuisine and culture. She also teaches Asian cuisine in numerous cooking schools across the country. Helen has lectured to various professional and culinary organizations such as the International Association of Culinary Professionals, Boston University Seminars in the Arts and Culinary Arts, Oldways Preservations and Exchange Trust, Small Business Development Center, The Culinary Historians of Boston, Women Chefs and Restaurateurs and the Culinary Guild of New England. In addition, she conducts culinary tours of Boston’s Chinatown and is a frequent guest chef at cooking schools around the U.S.
Helen is the author of Helen Chen’s Chinese Home Cooking (Hearst Books, 1994), Peking Cuisine (Orion Books,1997) and Helen’s Asian Kitchen: Easy Chinese Stir-Fries (John Wiley & Sons, 2009). 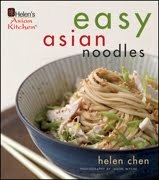 A second book in the Helen’s Asian Kitchen series, Helen’s Asian Kitchen: Easy Asian Noodles is scheduled for publication in January, 2010. A beautiful full-color collection of 60 easy and delicious Asian noodle recipes from Helen Chen. Packed with fun, affordable, and delicious recipes that you can make in a flash, Helen Chen's Easy Asian Noodles is the perfect cookbook for anyone who loves noodles. Helen Chen's EASY ASIAN NOODLES Reviewed by Eat. Drink. Memory. Welcome to my blog. I have been asked time and time again to provide a vehicle in which I can communicate with fellow food enthusiasts and share my experiences and background of Chinese cuisine and culture. I’ve never thought of myself as someone with a particularly interesting life or background (that’s the Chinese modesty coming out), but the more I share my personal history and thoughts with friends, acquaintances and cooking class students, the more they express their fascination and eagerness to hear more. So, here I am and here it is. This is a new media for me (yes, I pre-date the home computer age), but who says an old dog can’t learn new tricks? Thank you for visiting with me. I hope you will enjoy your stay and return often. Welcome to my blog. I have been asked time and time again to provide a vehicle in which I can communicate with fellow food enthusiasts and share my experiences and background of Chinese cuisine and culture. I’ve never thought of myself as someone with a particularly interesting life or background (that’s the Chinese modesty coming out), but the more I share my personal history and thoughts with friends, acquaintances and cooking class students, the more they express their fascination and eagerness to hear more.